Understand where and why directional valves are used. The different types available and how they work. 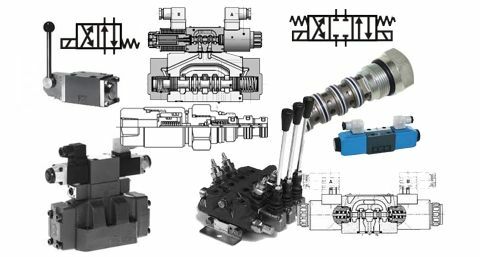 Directional valves are used to control the movement of hydraulic actuators, primarily cylinders or motors. In their simplest form, this may be a single, hydraulic on/off switch, opening and closing the hydraulic flow to part of the system. A common format is the 4-way, 3 position valve. These have four ports e.g. a supply and return line plus A and B system port. The valve can switch the flow between the supply port and the A port in one position, the B port in the second position and a final centre, rest position. These valves allow us to connect to the bore and annulus ports of a cylinder and therefore extend and retract a cylinder. There are many different switching configurations of directional valves. These are arranged to control all type of hydraulic switching requirements. Virtually every actuator that does not have a proportional valve, will have a directional valve to control its movement. Directional valves predominantly contain a single sliding spool that moves up and down inside the valve to direct the hydraulic flow along different pipelines. The spools and bores are made to very high tolerances and require specialist machines and skills to maintain the high-quality bore and spool concentricity and straightness, throughout their length. Look at the different directional valve symbols to see which ports they switch from, to or between. Valves can also have either two or three positions and are switched between the different positions by either, hand, electrical solenoid, air or hydraulic pilot. Some valves have springs to return them to their fall-back condition, some have detents that hold them in position until they are reset. The force required to switch the larger directional valve spools is generally higher than can be achieved by electrical solenoids, so often we will see a smaller hydraulic pilot valve fitted on top of the main spool section, to switch the valve using its internal pilot ports. Directional valves may also be known as on/off, black and white or 3-way etc valve. There are three main types of directional valves. Cartridge directional valves that fit into custom manifolds. Industrial CETOP, plate mounted directional valves. Mobile, mono-block slice directional valves. All come in a range of sizes and flows. Directional valves are either open or closed, there is no in-between, part flow position. Don't confuse directional valves with proportional valves. Proportional valves provide a measure of flow control depending on how far the spool is moved. Their operation and performance are markedly different. Spool configuration and crossover conditions e.g. as it passes from one condition to the other are the ports linked open or linked shut. Solenoid types, voltage, connector style, power-save options. Material types, seals, body, paint, label. One or two stage valves. Multi-stage valves have the option for different connections between the two valves or bringing in remote feeds and bleeds. Learn more about directional control valves in our 'Professional Training Section'. Understand their design features, performance limits, and how to specify directional valves.